As the West embraces the practice of yoga it integrates the experience of traditional yoga practice with personal experiences. After the first flourishing of yoga teachers who helped establish the main traditions of yoga practice in the West, a new wave of yoga teachers is helping to redefine yoga practice today. These yoga teachers are developing their own integrative approaches to yoga, taking into account the needs of modern Western men. Many of the new yoga innovators are Westerners, primarily American. Emerging approaches to yoga that combine the best of East and West, ancient and modern wisdom, are now being introduced and practiced throughout the United States. Though there are most likely at least half a dozen yoga studios and gyms that offer yoga classes in your neighborhood, finding the one class and the right teacher to suit your needs is not always easy. 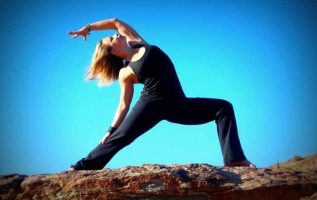 Start at the beginning with these steps and when you have completed all of them you are sure to have located the best yoga class and teacher combination for your schedule, location, interest, and temperament. * What are your choices? The telephone book, the internet, community newspapers, ad boards at your local health food store or organic grocery store – all of these are great ways to find out what is available to you. Spread the word that you’re looking for a good class. Your dental hygienist may turn you onto a class you’ve never heard of or your librarian may moonlight as an instructor on the weekends. You never know until you start looking. * When would you like to take your yoga class? Some people prefer to start their day very early with an energizing yoga class. Others like to wind down after work with a long, relaxing class and still others prefer to pop in a 20 minute yoga class every day during lunch or once a week on Saturday mornings. Determining when a class will best fit into your schedule will help you narrow down your choices. * Which yoga classes are most convenient to you? After you have chosen the best time for you to take your class, consider where you will be just before then. Are you coming from home or work? Do you need something to fill the time while your youngest takes his gymnastics class and therefore need a class near there? Finding one that is close to where you are at the time that you want to take the class will help you maintain an effective, consistent practice. * What type of yoga is taught at the schools that are close to where you want to be when you want to take your class? If you’re a beginner, you may not want to jump into a dynamic Ashtanga yoga class. If you’re more advanced, then a mild Kripalu yoga course may not be what you’re looking for to push your limits. Call the schools and centers that are left on your list and ask them to send you a list of classes they have available. From these, you will be able to see what is available during the time slots you have open. * Try them out! Most yoga schools and centers allow you to take one class without signing up for 10 weeks worth of practice. Experiment and try out all the classes that interest you. If you find more than one that appeals to you, maybe you can switch back and forth. If none are what you’re looking for, then go back to your original list and expand your parameters or see if there are any yoga schools that you’ve overlooked. Soon you’ll find the perfect class and the perfect teacher for your yoga practice. Stephen Kreutzer is a freelance publisher based in Cupertino, California. He publishes articles and reports in various ezines and provides yoga tips on www.justyoga.info.